The rent at Abberly at West Ashley Apartments ranges from $1,108 for a one bedroom to a $1,571 two bedroom. Apartments in this building are about 8% less expensive than the Charleston average. This is a pet-friendly apartment. Abberly at West Ashley Apartments has a Walk Score of 0 out of 100. This location is a Car-Dependent neighborhood so almost all errands require a car. 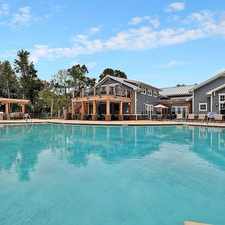 Enjoy extraordinary Low Country living at its best at Abberly West Ashley! Located just off I526 and HWY 17 (Savannah Highway), Abberly West Ashleys enviable location will afford you great access to all major thoroughfares, local services, and attractions including: Charleston International Airport, Boeing, Tanger Outlets, Citadel Mall, Medical University of South Carolina, Charleston beaches, and Historic Downtown Charleston. With a mix of stylish architecture, distinctive interior features, and the added convenience of elevators in controlled access buildings, Abberly West Ashley is certain to offer you a remarkable and modern living experience. Each apartment home includes a washer and dryer, energy efficient appliances, unique open floor plans, and screened outdoor living space. Life doesnt just happen in your home! As a resident, you will also enjoy exclusive access to the 24-hour cardio and strengthening studio, business technology lounge, billiards room, and social hot spot with flat screen TVs for your viewing and entertainment pleasure! The onsite Abberly West Ashley team is also available to provide you with the service and attention you need to live easy and live well! We are all HHHunt team members and therefore part of the ownership group. We promise to be employee centered, customer focused, a provider of quality products and services, and an engaged community partner. In business for over 50 years, HHHunt believes these to be the most important promises we can make to you, our customer, to ensure you have the best living experience possible. We are committed to be of service to you, and of service to the Charleston community at large. Let us know how we can better assist you in your needs or speak to any of our representatives to find out how you can give back to the community with HHHunt and be a part of something truly special! Explore how far you can travel by car, bus, bike and foot from Abberly at West Ashley Apartments. Abberly at West Ashley Apartments is in the city of Charleston, SC. Charleston has an average Walk Score of 40 and has 120,083 residents.